By yesterday, I had reached the point in the week where there were several things that I wanted to make for the childrens wardrobes. but nothing that I HAD to make. Unsure what to make next, I asked Rascal what she wanted. It was no surprise when she said that she asked for another dress, I smiled as I had just the fabric for it, but I asked if she would like to choose what material I used. We went and looked together and guess what? She picked the fabric that I had in mind- patterned corduroy with owls on it. I will admit that I had plans to use a different pattern for this dress, but once I printed it out, I realised that the bodice was going to be too wide for Rascal. It would've been fairly easy to alter it, but I was feeling lazy and honestly couldn't see the point of risking disaster when I knew that the other pattern works so well. Then I sort of lost motivation. I sat and looked at the fabric and couldn't get up the enthusiasm to cut into it (does anybody else get that?) Once the fabric is cut, I am away and running, but until then its sometimes a battle to get started. When I finally started to sew, it was an easy sew and Rascal is very happy with the results. Unfortunately, the only photos that I have of it are dodgy badly lit nighttime photos and a couple of blurry photos of an excited girl before she went to preschool this morning. Here is the best of a bad bunch. Today, I must admit that I'm struggling to find the motivation to sew childrens clothes, I really want to get on and start making stock for market, so I think I'm going to move onto the next thing on my long list of things that need to be sewn. I have really really enjoyed the challenge of making all these clothes for my children and have loved seeing their faces when they try each new piece on. What I achieved this week! 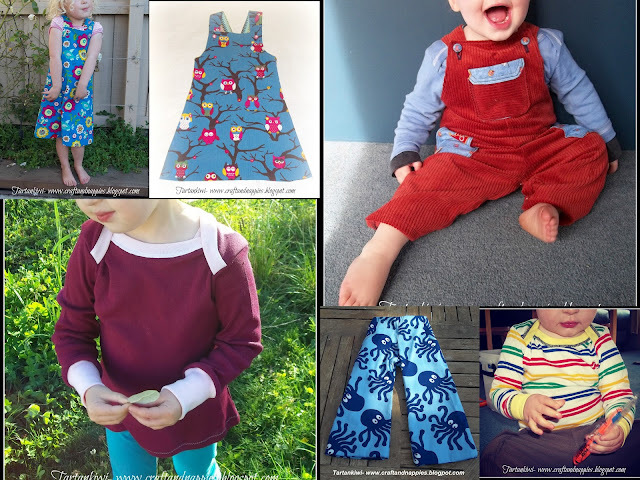 If you are tempted to sew clothes for your children, hop over to the KCWC Flickr group and have a look at all the beautiful clothes that have been created this week and believe me- if we can do it, you can do it too! Oh my goodness...such creativity! Can't believe you got that done in a week...i have only just managed to finish some cord pants and jumpers for the twins after a few weeks! 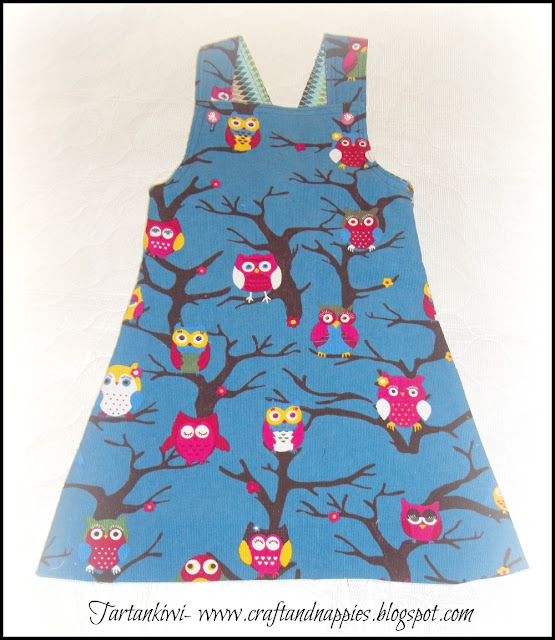 I love that print...my girls love owls...and i have been looking for a dress pattern very similar to that...did you draw it up yourself? 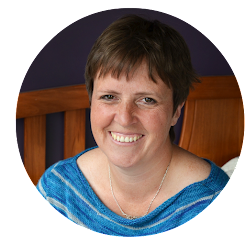 Thanks for sharing your lovely work! WELL DONE!! I say it all the time, but you are so good juliet! 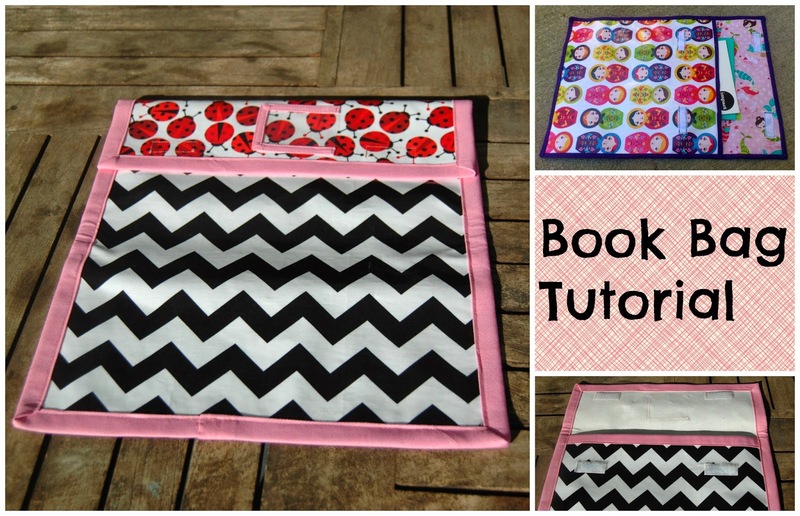 you have come so far in your sewing! Practice makes perfect? any other helpful tips? Oh yes I also lose motivation.... this week has been a real kick up my bum! Love the dress... she chose well! I love today's dress, such a great fabric! really good job this week! See you in fall? work with for my age depending on the authentic super dmz?